10 PACK High Yield (5x 30 XL Black, 5x 30 XL Color) – Est. Page Yield – 670 Pages (Black), 550 Pages (Color) Kodak Printer Ink, Kodak Ink Cartridges, Kodak Ink, Kodak 30 Ink, Kodak Ink Cartridges 30. 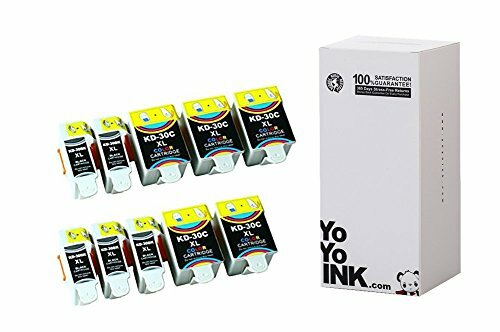 YoYoInk is a top seller for Compatible Kodak 30B / 30C XL Printer Ink Cartridges. These printer ink cartridges are of the highest quality as YoYoInk strives for excellent customer satisfaction with all its products. The Compatible Kodak 30B / 30C XL Printer Ink Cartridges come with a money back, customer satisfaction, two year guarantee. Kodak Printer Ink, Kodak Ink Cartridges, Kodak Ink, Kodak 30 Ink, Kodak Ink Cartridges 30. Fast shipping and very good quality ink and an incredible price! Don’t think i’ll ever buy anywhere else again. I would add these to my favorites! Fantastic and affordable. I would recommend and will likely purchase again!. Ink went all over the place when I pulled the protective cap off. That being said, I got 10 cartridges for what I would have paid for 1 at the store, and the colors are true. Very good ink so far. I do not print a lot but I will let you know when something is not right. and It won’t be my printer… Peace To You, John Campbell This ink is no good. It does skip and does not last long. Not enough ink in Cartridges……Poor Product. So glad I took the chance and ordered these. I’ve only used one black cartridge in my Kodak printer, but it fit right in and I didn’t get an error message. Works fine. I’ve only printed 5 documents, but the print quality is awesome. Would definitely order again. Good product, great deal, great customer service. The packaging was great and it arrivied on time. I will recommend your product and buy again when I need ink. Thanks for the great deal!!! Wow! I was super skeptical – I have always paid full price for Kodak ink in the past, but I couldn’t pass up the opportunity to try this because it was such a deal! So far they work great! I have used both the black and color cartridges and my printer hasn’t given me any errors and prints out beautiful! Thanks so much! Update – a few months later and I have used both color and black for many many prints – I still haven’t had to replace even one cartridge yet – amazing – I think this purchase is going to last me a whole year – maybe more! I am impressed! So far so good. Just received a new print head which was the initial problem and the cartridges worked out of the box. I’ll update review if necessary but so far, great buy. How many times have you thought “this is too good to be true” when buying an item like this. The price is amazing. You can buy a ten back of and color mix for what it could cost to buy one name brand. So usually if someone is charging 1/10th the price than the other guy his produce must not be as good. It nearly as good actually with such a huge price difference. So when this came in the mail i had super low expectations. But the price was just so good I just had to try. And boy am I happy i did. As soon as it came in the mail I had a good feeling that I had just hit a home run. You may not be able to judge a book by its cover but you can judge a product the kind of packaging that it’s in. And instead of it being some low budget box the ink cartridges actually came in a very nice box all individually sealed in an easy open package. Instructions were great and installation was no different than the name brand. It snapped in very easily and has worked perfectly ever since. If there’s any difference in color quality I can’t tell. And for what I need it for it wouldn’t matter any way. But it is good quality. So to sum it all up if you are buying regular ink you are crazy. I will never in my life buy ink from anyone else again and I don’t see why anyone else would either. So far so good! You wouldn’t know I was not using kodak ink. I’m on the first cartridge, so will update if anything changes. Right now, I would definitely buy this product again. Prior to this I have always used Kodak ink and was tired of paying the money it cost, although Kodak ink is in no way expensive. I decided to try this Yo Yo Ink and ordered a package. I loaded it shortly after receiving the shipment and are more than happy with the results I have received so far in both color and black printing. I am sorry that I didn’t try this before. Great product! Got this fast . Love the cost compared to Kodak . Worked great. Wonderful!!! Ink is good and seems to lasting awhile…I had stopped buying ink because Kodak? ?s was so expensive, THRILLED with this purchase!